Since he embraced kitsch and practically hid his most clever comments by saying them in the same soft tone of voice as everything else he said, was Bob Ross the ultimate anti-hipster? 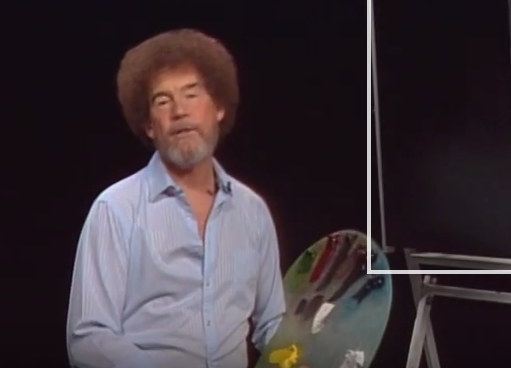 If a happy little tree falls in the forest, but nobody’s there to hear it, does it softly whisper, “Hey, it’s okay, we’re all having a good time learning together here, and there are no mistakes, just happy accidents”? You may be onto something, although first you must get past the “Bob Ross basically invented YouTube before it was cool” claims from hipster tech-media outlet, Motherboard. Admittedly, that’s pretty damn hipster. But here’s the thing, and it’s something the Motherboard article touches on when it describes how even overcaffeinated Counter-Strike players take a break from dissing each other’s mothers to watch Joy of Painting reruns: people love Bob Ross. He enjoys near-universal positive regard, and there’s just no way to square that with the universal disdain for hipsters that almost everyone — even fellow hipsters — will proudly assert if given half a chance. Ross’s earnest kindness and unflappable positivity give him this genuine appeal, which implies that, rather than being ahead of his time, he was for all time. In that regard, I think Bob Ross is anti-hipster in word and deed alike.